When billionaire entrepreneur Elon Musk founded his private spaceflight company SpaceX back in 2002, he had two goals in mind: to reduce the cost of space transportation, and to colonize Mars. Mars colonization may sound farfetched, but Musk is serious. In an April 2011 interview with The Wall Street Journal, Musk said he hopes to send humans to Mars' surface within 10 to 20 years. Then in a July 2013 interview with The Guardian, he said he'd like to fund a colony of 80,000 people on the red planet – and become a colonist himself. 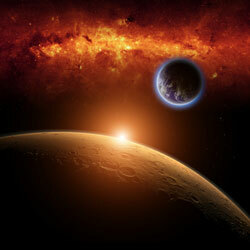 "The key thing for me is to develop the technology to transport large numbers of people and cargo to Mars. That's the ultimate awesome thing." You see, Musk believes colonizing Mars is the best way to prevent the extinction of humankind. In the same 2013 interview, he stated, "There's no rush in the sense that humanity's doom is imminent; I don't think the end is nigh. But I do think we face some small risk of calamitous events. It's sort of like why you buy car or life insurance. It's not because you think you'll die tomorrow, but because you might." But Musk has never said what he considers the biggest threat to humankind – an asteroid, a pandemic, World War III, or otherwise. A month ago, one Redditor may have pieced it together. He examined Musk interviews, investments, and other work. And in a popular post that has drawn more than 100 comments, he pinpointed what is likely the billionaire's biggest impetus for Mars colonization. Nope. Elon has been quoted as saying "the AI would follow us to Mars pretty quickly."